CAIRO A protest by at least 100,000 Egyptians outside the presidential palace in Cairo turned violent on Tuesday as tensions grew over Islamist President Mohammed Morsi's seizure of nearly unrestricted powers and a draft constitution hurriedly adopted by his allies. Crowds around the capital and in the coastal city of Alexandria were still swelling several hours after nightfall. The large turnout signaled sustained momentum for the opposition, which brought out at least 200,000 protesters to Cairo's Tahrir Square a week ago and a comparable number on Friday. They are demanding the Morsi rescind decrees that placed him above judicial oversight. In a brief outburst, police fired tear gas to stop protesters approaching the palace in the capital's Heliopolis district. Morsi was in the palace conducting business as usual while the protesters gathered outside. But he left for home through a back door when the crowds "grew bigger," according to a presidential official who spoke on condition of anonymity because he was not authorized to speak to reporters. The official said Morsi left on the advice of security officials at the palace and to head off "possible dangers" and to calm protesters. Morsi's spokesman, however, said the president left the palace at the end of his work schedule through the door he routinely uses. The violence erupted when protesters pushed aside a barricade topped with barbed wire several hundred yards from the palace walls. Police fired tear gas, and then retreated. With that barricade removed, protesters moved closer to the palace's walls, with police apparently choosing not to try and push the crowds back. Soon afterwards, police abandoned the rest of the barricades, allowing the crowds to surge ahead to the walls of the palace complex. But there were no attempts to storm the palace, guarded inside by the army's Republican Guard. The brief outburst of violence left 18 people injured, none seriously, according to the official MENA news agency. Protesters also commandeered two police vans, climbing atop the armored vehicles to jubilantly wave Egypt's red, white and black flag and chant against Morsi. Nearly two hours into the demonstration, protesters were mingling freely with the black-clad riot police, with many waving the flag and chanting against Morsi. There were as many as 100,000 protesters in the immediate vicinity of the palace and the wide thoroughfare that runs by it. Thousands more filled side streets leading off the area. Many in the crowd were chanting "erhal, erhal," Arabic for "leave, leave" and "the people want to topple the regime"  two well-known chants from the 2010-2011 Arab Spring revolts that toppled Mubarak and other Middle Eastern and North African rulers. In Alexandria, some 10,000 opponents of Morsi gathered in the center of the country's second largest metropolis. They chanted slogans against the leader and his Islamic fundamentalist group, the Muslim Brotherhood. The protests were dubbed "The Last Warning" by organizers amid rising anger over the draft charter and decrees issued by Morsi giving himself sweeping powers that placed him above judicial oversight. Morsi called for a nationwide referendum on the draft constitution on Dec. 15. 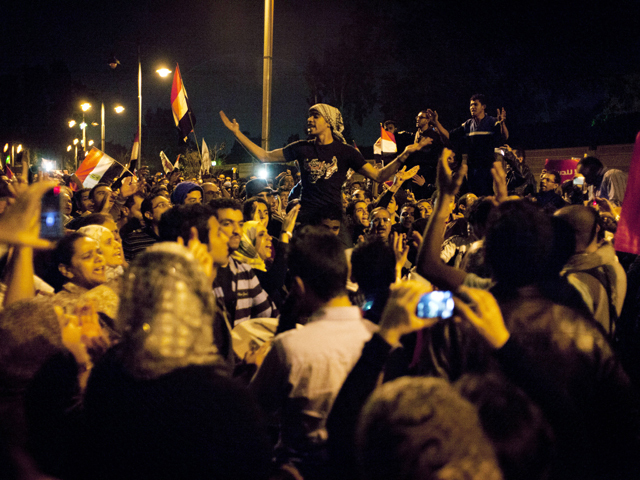 It is Egypt's worst political crisis since the ouster nearly two years ago of authoritarian president Hosni Mubarak. The country has been divided into two camps: Morsi and the Brotherhood, as well as ultraconservative Salafi Islamists, versus youth groups, liberal parties and large sectors of the public. Tens of thousands also gathered in Cairo's downtown Tahrir Square, miles away from the palace, to join several hundred who have been camping out there for nearly two weeks. There were other large protests around the city separate from the one outside the palace. Smaller protests by Morsi opponents were staged in the southern city of Assiut, an Islamists stronghold, and the industrial city of Mahallah north of Cairo as well as Suez. "Freedom or we die," chanted a crowd of several hundred outside a mosque in the Abbasiyah district. "Mohammed Morsi illegitimate! Brotherhood! Illegitimate!" they also yelled. "This is the last warning before we lay siege to the presidential palace," said Mahmoud Hashim, a 21-year-old student from the city of Suez on the Red Sea. "We want the presidential decrees cancelled." Several hundred protesters also gathered outside Morsi's residence in an upscale suburb. "Down with the sons of dogs. We are the power and we are the people," they chanted. A statement by his office said he met Tuesday with his deputy, prime minister and several top Cabinet members to discuss preparations for the referendum. The statement suggested business as usual at the palace, despite the mass rally outside its doors. The Islamists responded to the mass opposition protests last week by sending hundreds of thousands of supporters into Cairo's twin city of Giza on Saturday and across much of the country. Thousands also besieged Egypt's highest court, the Supreme Constitutional Court. The court had been widely expected Sunday to declare the constitutional assembly that passed the draft charter on Friday illegitimate and to disband parliament's upper house, the Shura Council. Instead, the judges went on strike after they found their building under siege by protesters. The opposition has yet to say whether it intends to focus its energy on rallying support for a boycott of the Dec. 15 vote or defeating the draft with a "no" vote. "We haven't made any decisions yet, but I'm leaning against a boycott and toward voting `no,"' said Hossam al-Hamalawy of the Socialist Revolutionaries, a key group behind last year's uprising. "We want a (new) constituent assembly that represents the people and we keep up the pressure on Morsi." The judges' strikes were part of a planned campaign of civil disobedience that could spread to other industries. On Tuesday, at least eight influential dailies, a mix of opposition party mouthpieces and independent publications, suspended publication for a day to protest against what many journalists see as the restrictions on freedom of expression in the draft constitution. The country's privately owned TV networks planned their own protest Wednesday, when they will blacken their screens all day. Morsi's Nov. 22 decrees placed him above oversight of any kind, including the courts. The constitutional panel then rushed through a draft constitution without the participation of representatives of liberals and Christians. Only four women, all Islamists, attended the marathon, all-night session. The charter has been criticized for not protecting the rights of women and minority groups, and many journalists see it as restricting freedom of expression. Critics also say it empowers Islamic religious clerics by giving them a say over legislation, while some articles were seen as tailored to get rid of Islamists' enemies.